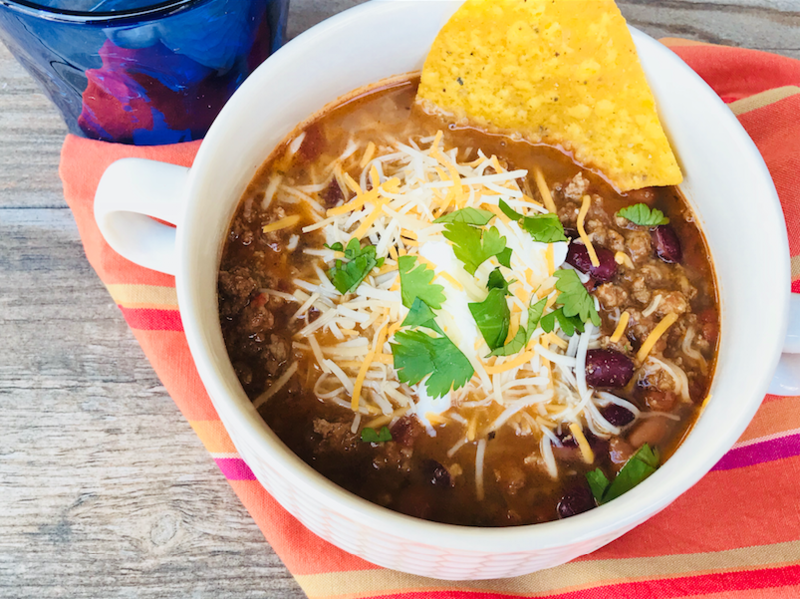 This turkey chili taco soup recipe is a delicious alternative for Taco Tuesday using ground turkey. 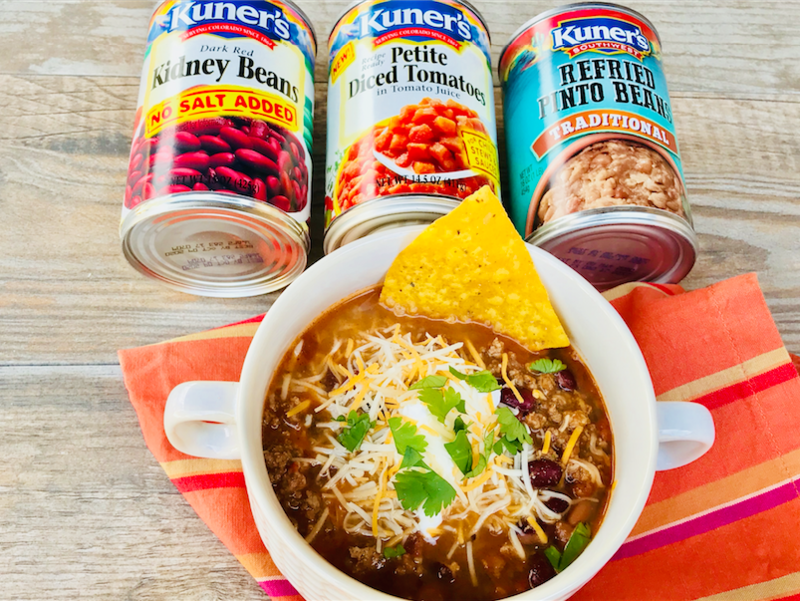 It combines both chili fixings like kidney beans with canned tomatoes with some taco night components like refried beans and taco seasoning. I like to use lean ground turkey to lighten the whole dish up and with all the seasonings and veggies, you’ll never know the difference. 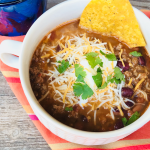 My kids absolutely love chili and they love tacos, but they were a little weary of the whole chili taco soup concept because they saw all this liquid in the pot. But, as soon as I plated each soup bowl with the toppings, they ate it up and didn’t say a word, other than asking for seconds! Combine browned ground turkey with spices, canned beans, canned tomatoes and sauce and chicken broth. Spice it up just a touch with the addition of a chopped jalapeno pepper. I like a little heat in all my Mexican dishes. Top with sour cream and your favorite shredded cheese and cilantro or diced scallions to have a complete meal. Super budget friendly and because it’s loaded with veggies and healthy ground turkey, you can feel good about eating this meal for dinner and having leftovers for lunch! We partnered with Kuner’s Foods to bring you this recipe and the video you see below as well. I love the Kuner’s Petite Diced Tomatoes in my soups, stews and chiles as do my children because you get more bits and pieces of tomatoes in each bite, rather than just huge chunks of tomatoes. The Kuner’s Southwest refried beans are great in this recipe – and they actually come in a variety of flavors including – refried black beans with lime juice, traditional refried pinto beans, refried black beans with roasted chiles, and refried pinto beans with roasted chiles. If you choose a refried bean option with the chiles, it adds another depth of flavor to the soup, so you may skip the jalapeno, or you can leave it if you like a little extra heat like I do. Right now is a great time to stock up on Kuner’s canned beans at Safeway. They are on sale for $.89 through the month of February and there is a buy one get one free coupon in the January inserts as well as additional printable coupons available over on Kuner’s website. 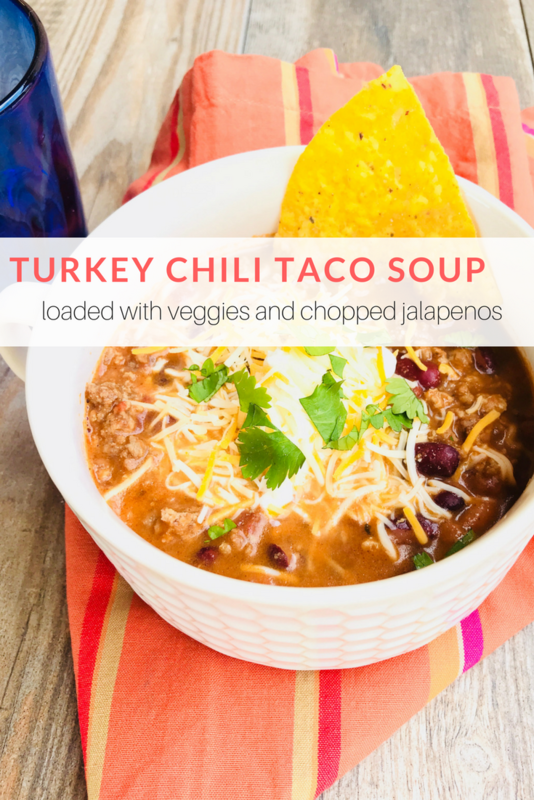 Fresh ground turkey is combined with beans, tomatoes, jalapeno, peppers and taco seasoning to give you a one pot meal of chili and taco soup. Top it off with sour cream, shredded cheese and cilantro for a delicious meal. In a large pot or dutch oven, heat olive oil, then brown the ground turkey over medium heat, breaking it up with a wooden spoon as it cooks. When cooked through, add the onions and bell pepper and jalapeno pepper and cook 2-3 minutes. Add canned tomatoes, beans, tomato sauce, re-fried beans, taco seasoning and chicken broth and stir to combine. Bring to a boil, cover and simmer about 10-15 minutes. Serve with your favorite toppings such as low fat sour cream, jalapeños, shredded cheese, chopped scallions, onions, or chopped fresh cilantro. This is a sponsored post and we appreciate you supporting the brands that make this site possible. Check out additional recipes we’ve shared for Kuner’s Foods below. Kuner’s has additional delicious recipes and money saving coupons on their website that you can check out here. Be sure to pin this recipe to your Pinterest board here. If you try this recipe, we’ve love to hear your feedback in the comments below. You can also tag us on Instagram with your version! This is delicious! I was nervous about the fresh jalapeno, but it turned out just fine, not overly spicy. My husband added more fresh jalapeno because he wanted the heat! Sounds good. Could also be great as a vegetarian dish. Oh the possibilities. ?